(FinalCall.com) Minnesota congressman Keith Ellison is seeking to lead the Democratic National Committee as the party seeks someone to bring Democrats into the political Promised Land. There is nothing wrong with Rep. Ellison’s desire to move his party forward or his desire to help make America progress. But he must be condemned and lambasted for trying to make his political bones by smearing the Honorable Minister Louis Farrakhan. The Minnesota congressman has been attacked for a connection with the Nation of Islam years ago, while in college and for support of the Million Man March. The Anti-Defamation League and others have branded Rep. Ellison as unfit for office, saying he is tainted by the anti-Semitism of Farrakhan and the Nation of Islam. Given that neither the Minister nor the Nation are anti-Semitic, a man with principles and courage would have stood up on the truth, the track record and the history of the Minister and his followers. Over the past 40 years, the Nation and the Minister have not harmed nor prohibited any Jewish person from exercising their rights to life, liberty and the pursuit of happiness. It was not Muslims who chanted in the 1980s, “Who do you want? Farrakhan! How do you want him? Dead!” as the Jewish Defense Organization did. It was not the Nation of Islam nor the Minister who were involved in a 1990s alleged death plot featuring Jewish federal stooge Michael Fitzpatrick. Mr. Fitzpatrick seized on the pain and vulnerability of Quibilah Shabazz, a daughter of Malcolm X, and federal authorities charged her with planning the murder of the Minister. It was the Minister whose blast of truth shook the feds as he declared the FBI has never been his friend. The Minister declared he wanted nothing to happen to Malcolm X widow Dr. Betty Shabazz, or her daughters and pulled the covers off of an old enemy, while seeking reconciliation. His stand was so incredible the feds essentially dropped the charges against Qubilah Shabazz and a rapprochement between the Nation and Dr. Shabazz started. She was featured as one of the speakers of the 1995 Million Man March. The prosecutors in this fiasco, by the way, were located in Rep. Ellison’s home state of Minnesota. Mr. Ellison, who was captured in at least one photo distributing The Final Call while in college, condemned the Minister as he sought his new place. But his cowardly and baseless repudiation is nothing new. While running for Congress a decade ago, his “I’m not with Farrakhan and he’s a hater” narrative started. But let’s go back and examine words published in the Nov. 6, 1995 edition of Insight News, a Black weekly in Minneapolis: “Third, Minister Farrakhan is a role model for Black youth; however he is not an anti-Semite. He is a sincere, tireless and uncompromising advocate of the Black community and other oppressed peoples in America and around the world. Despite some of the most relentless negative propaganda anyone has ever faced, most Black people regard him as a role model for youth and increasingly, a central voice for our collective aspirations. “I am sensitive to members of the Jewish community who have been lead to believe that Minister Farrakhan is anti-Jewish. I believe they should do two things: engage in a dialogue with Black people who support Minister Farrakhan (which includes Cornel West, Jesse Jackson, Ben Chavis, Dorothy Height and many others) and urge their leadership to engage in the dialogue proposed at the Million Man March. That’s pretty powerful language and a powerful argument penned by one Keith X Ellison. Yes. That’s the same Rep. Keith Ellison who represents the Fifth Congressional District in Minnesota and seeks to chair the Democratic National Committee. He was also once known as Keith Ellison-Muhammad. If Mr. Ellison once believed those things about the Minister and changed his mind, that’s his business. We will leave Allah (God) to judge and handle the hypocrites. But what cannot be tolerated are the lies, the slander and false narrative against Min. Farrakhan. These lies cannot be proven, nor can these false charges be sustained. The Minister has been a strong voice for Black self-determination, a warrior against Jewish paternalism and control of Black people and a sledge hammer against the wall of White supremacy and neo-colonialism. None of that work would make him the favorite of a system or wicked people whose demonic rule he is working to destroy. But Mr. Ellison knows better. Years ago sitting in my Chicago office here at The Final Call, when I was managing editor, there was no question about Min. Farrakhan and who he was. 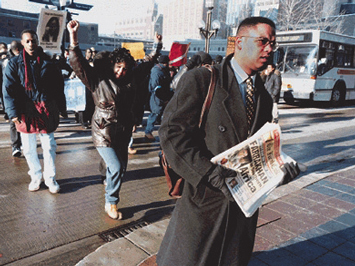 There was no question when Mr. Ellison, aka Keith X Ellison, aka Keith Ellison-Muhammad, came to Chicago for an urban peace summit in October 1993 that featured Min. Farrakhan, or a vital summit in Kansas City that included Min. Farrakhan as the major speaker and one who helped legitimize the anti-violence movement in April 1993. The problem comes from a simple place: “All of you that want national and state prominence: Sometimes I am the ‘litmus test’ to see if White folk can do anything good for you. And some of you are so weak and so cowardly, that your desires mean more than the integrity of your being. But every time I forgave my brothers, and kept moving forward,” observed Min. Farrakhan in a message delivered Oct. 30. The Minister’s forgiveness and willingness to suffer insults apparently has led some to think that there is no end to his patience and smearing him is acceptable— just come back and apologize in the dark later. No. This man’s life’s work, his status as a vibrant elder and indispensable leader in our community cannot and must not allow that. Mr. Ellison and those who would misuse the Minister’s name for their personal advancement must be confronted and their hypocrisy and cowardice must be condemned. How can Rep. Ellison speak of justice for the poor, a just U.S. foreign policy, social change that improves the lives of people and respect for all and denigrate a man who has worked to achieve those goals for longer than the congressman has been alive? Shame on you Mr. Ellison for your pandering and shame on us if we don’t call you out for it.